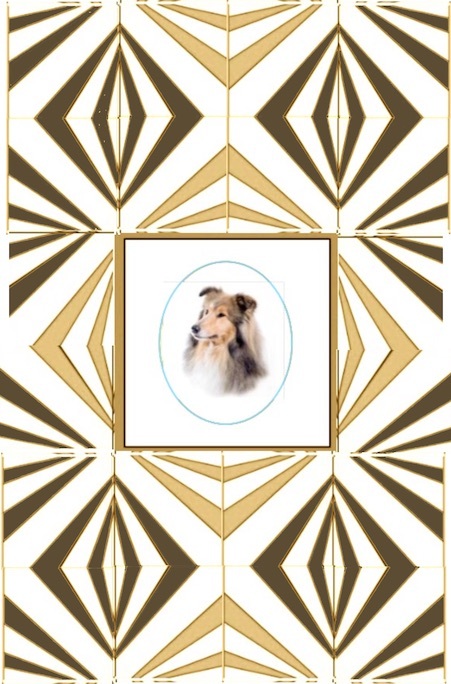 Hello, I'm in the process of making a bed size quilt using the Burst BLock by Ron Appell. 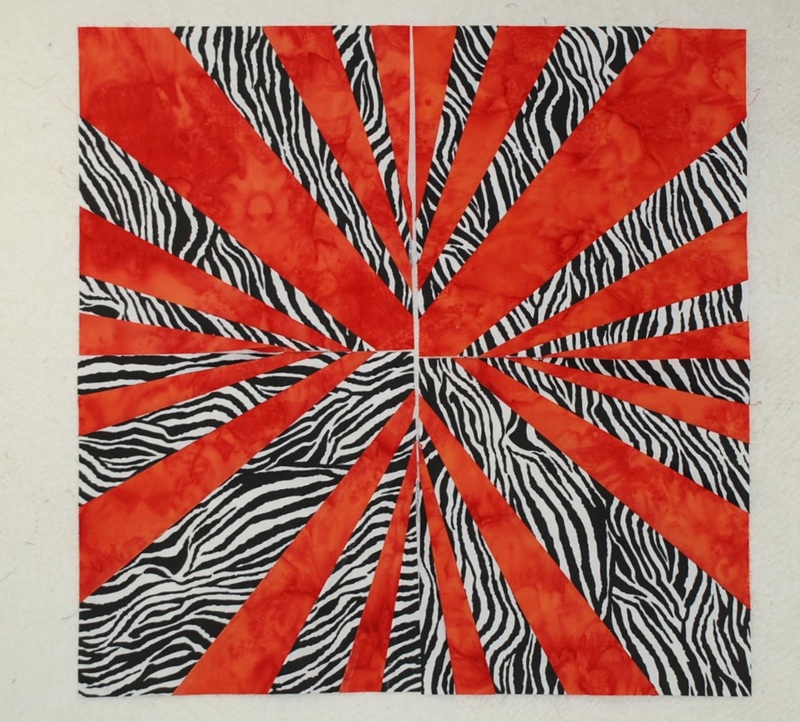 I'm using zebra fabric as one of the main fabrics and batiks in 25 different colors as the other fabric. I made a trial run using the zebra fabric as the background fabric and then another trial block using the batik as the background fabric. I thought I'd make 2 of each using the same fabrics and arranging them in oppposite corners but now I'm not so sure I like the effect. Here are 2 photos, one showing them in opposite corners and the other showing them together, one set on the top and the other on the bottom. Which do you think will give the best effect? Now remember I have 25 batiks going from yellow to dark purples with every color inbetween. Any suggestions would be greatly appreciated. I'll be making 100 blocks in all plus possible border. 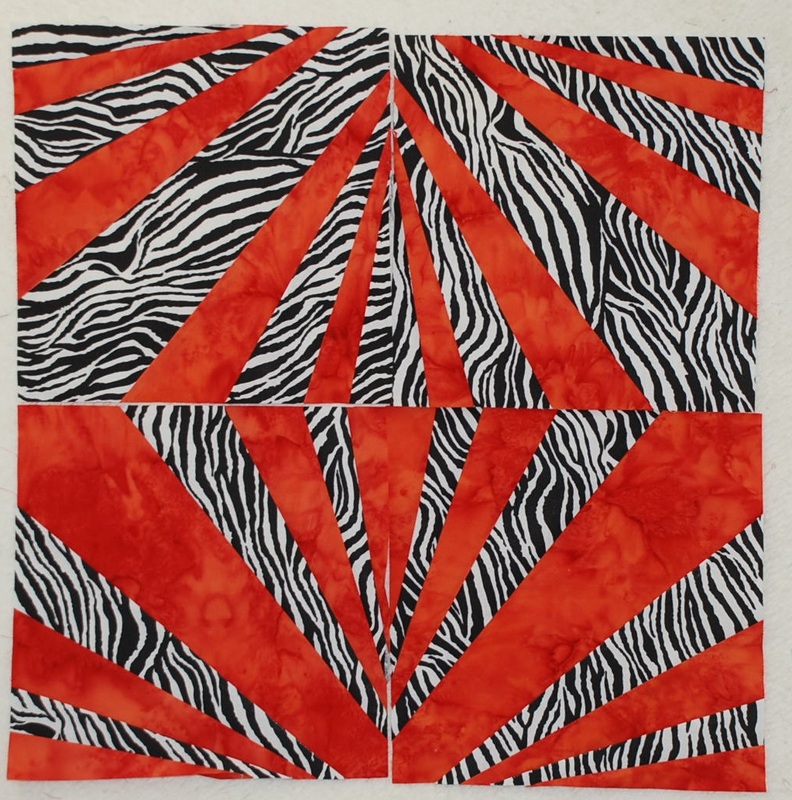 Love zebras and batiks therefore love your fabrics!!! If it were me I would make them all the same instead of switching up the background fabrics. My first instinct was the top photo in your second photo because I love zebras so much. But after further consideration, I personally would do them all like the bottom of your 2nd photo. I am a type A personality and I personally would be bugged by all of the wider zebra stripes meeting up at the seams but not quite matching up. Plus I think having larger sections of batiks might help calm down all that awesome stripe-y-ness and make that zebra fabric pop more. It's going to be so cool. Please post pics when you are done. Last edited by lmanna; 03-07-2018 at 08:50 AM. I have that pattern too but haven't tried it. I love the idea of using the zebra as the one constant then adding the different colors...I love bright colors in general! I also prefer the first picture setting. It's going to be a spectacular quilt, looking forward to seeing it! I prefer the top photo! Looking forward to seeing what you create! I also like the top picture. It looks more like a complete block. The wonkier the better for me. I like the first photo. This is gonna be a cool quilt. The top one gets my vote. When I look at the bottom photo, I keep mentally trying to spin the blocks so they "look right" to my eyes, which I suppose is the starburst arrangement. wow, this will be spectacular! Have you considered doing two blocks of each color? One with zebra as background and one with batik as background? qltnmom, that's what my photos show, 2 of each placed in opposite corners. The bottom pic shows them 2 on top and the other 2 on the bottom. I changed the location of the blocks so their small points meet at the middle. Might make it easier to look like a complete block. So there's a 3rd choice for arrangement. Its a hard choice as the 1st pic was my 1st choice, 2nd my 2nd choice and now this one as my 3rd choice. Nothing like making it more difficult to choose. Still have a couple weeks before I have to decide once and for all. And of course the 4th choice is to make them all the same using the one fabric as the background fabric..........but which one? I don't particularly care when using the zebra as the background fabric how the edges meet either but have already cut half the blocks using it as the background fabric. Dumb move on my part. 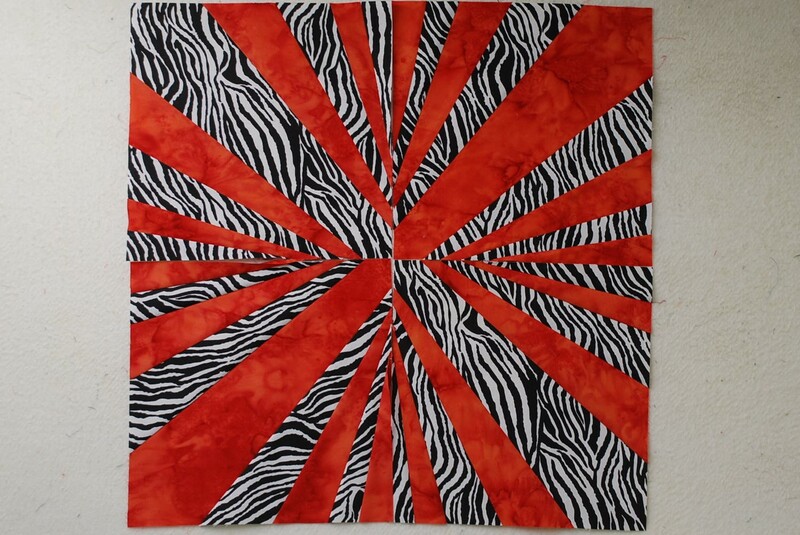 I did a search on pinterest for burst block ([url]https://www.pinterest.com/search/pins/?q=burst%20block%20quilt&rs=rs&eq=&etslf=2322&term_meta) and also on MSQC (http://blog.missouriquiltco.com/burst-block-quilt/) and after looking at them, I would go with the middle set of blocks. But if want totally wonky, definitely the first photo. Last edited by JanieH; 03-08-2018 at 01:38 PM. Reason: Hoping I got the links correctly. I made a Burst Block quilt. Just to let you see how mine looks. Wow I love that. I'm not sure which I like the best. I have that ruler and have forgotten about it. I also think I have that zebra fabric. Great idea to use it here. This might be just the quilt I need to make for my son for Christmas. Love the colors and I would go with the top one. I like the first photo. I think that one looks best with your fabrics. I want to see it when it's finished! I was having so much trouble deciding on which version to go with and I really wanted the zebra fabric to be the background fabric as but didn't care how they matched up on the sides so came with an answer what to do about that. I would make the last fabric solid black. Now I know this wasn't one of the choices but I think this might solve the issue with the wonky sides meeting up and would even give it a little more "WOMP". I'll make a set up with this idea and see how you all like it. Problem right now is I have half the blocks already cut using the zebra as the background (center) fabric. Will post again in the next day or two. Well, I told you I'd be back with another arrangement and I think this one will work. I didn't care how the zebra fabric came together on the edges so I changed it out with a solid black I had in my stash. Made 2 more of the same blocks using the zebra fabric as the background fabric as I had planned originally instead of 2 and 2. Like how the black makes a "statement". What do you think? I really, really like your new block.